When you buy $39 worth of posters, just ask for one of these two free posters when making your order! If you order $75 worth of posters...ask for two free posters. 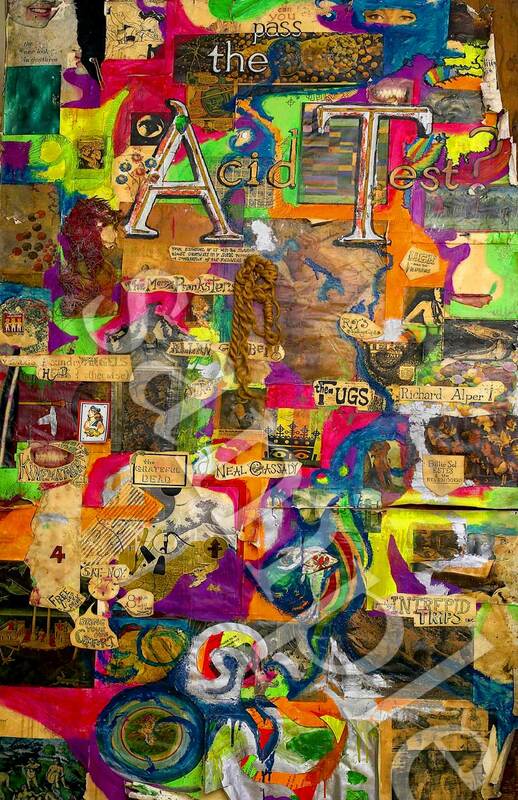 Description: A stunning reproduction of the Norman Hartweg-designed 1965 Acid Test poster. Measures 58x45.5cm. This colorful version prints the design in multi-colours over a blue psychedelic checkerboard pattern. Limited Edition. Thick Paper. FIRST EDITION REPRINT, THIS IS THE FIRST EVER REPRINT OF THIS HISTORIC POSTER, ONLY A HANDFUL OF THE ORIGINALS EXIST. DAY-GLO FLORESCENT RED PAPER (JUST LIKE THE ORIGINAL) THE SCAN DOES NOT SHOW THE BRIGHT EYE POPPING FLORESCENT COLOR OF THIS. SPECIAL ATTENTION TO DETAIL ON THIS CLASSIC POSTER, REAL LITHOGRAPH PRINT, NOT SOME INKJET PRINT. PLENTY OF WEIRD, SILLY HUMOR ALL OVER THIS POSTER! THIS IS A VERY SPECIAL REPRINT - ONLY A HANDFUL OF THE ORIGINALS EXIST, AND THEY FETCH UP TO $70,000. ORANGE PAPER, THE SCAN DOES NOT SHOW THE BRIGHT EYE POPPING DETAIL OF THIS POSTER. SPECIAL ATTENTION TO DETAIL ON THIS CLASSIC POSTER, REAL DIGITAL OFFSET PRINT, NOT SOME INKJET COMPUTER PRINT. additional posters and blotter art are shipped together at NO EXTRA CHARGE (FREE SHIPPING). REAL PRINT, NOT AN INKJET PRINT! I can sign it for you if you like...and even write something to you like "Never get off the bus, or have you passed? ", etc if you ask me nicely on your payment. 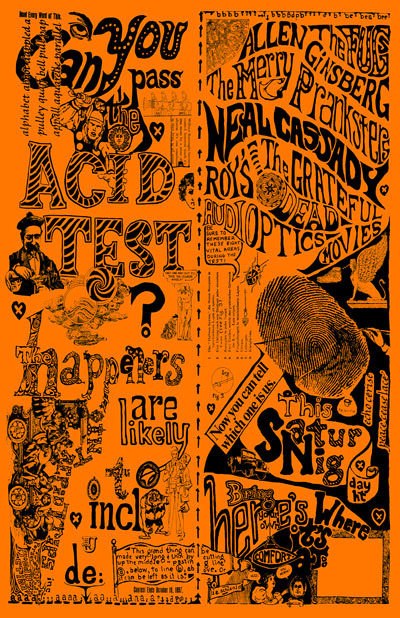 The Acid Test Signboard sat outside of the venues to advertise the craziness indoors! 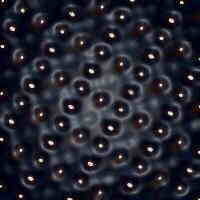 It now resides at the Smithsonian Institution, they have sent us a high resolution photograph file. We have professionally printed a small number of these historical images on 11 X 17 glossy paper. 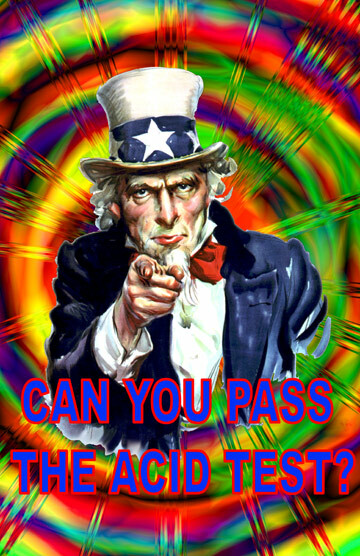 The motto of Ken Kesey and the Merry Pranksters! This is the REAL "Magic Bus" from the infamous 1964 "trip." 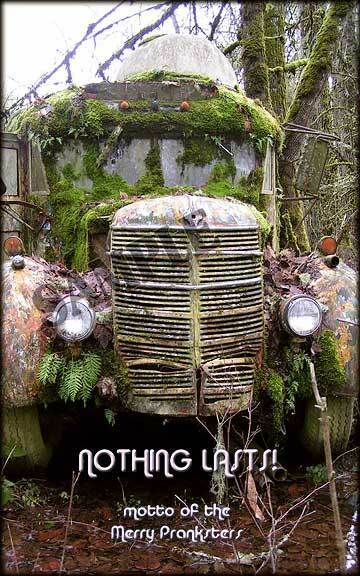 Ken Kesey's 1939 International Harvester as it sits in the woods on his farm. Picture by me (Zane Kesey), I can sign it for you...and even write something to you like "Never get off the bus, or Stay on the bus", etc if you ask me nicely when ordering. 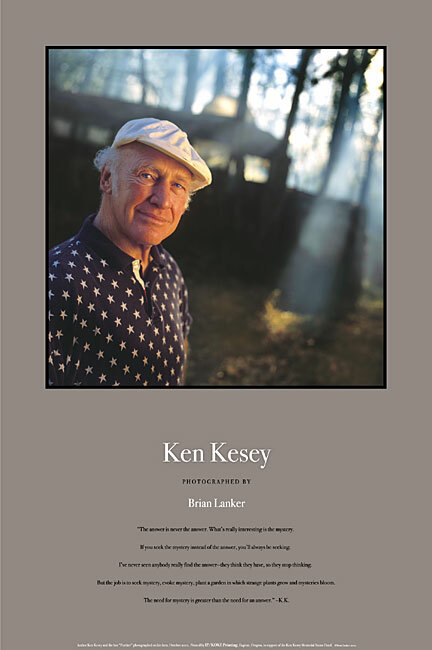 This photograph of Ken with the original bus "Further" was taken on Ken's Pleasant Hill farm in October, 2001, just prior to his passing, by Pulitzer Prize-winning photographer Brian Lanker.. 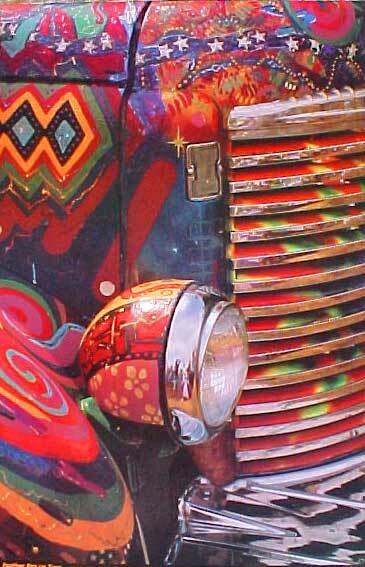 This 20 x 30 inch poster includes the inspiring words of Ken Kesey. 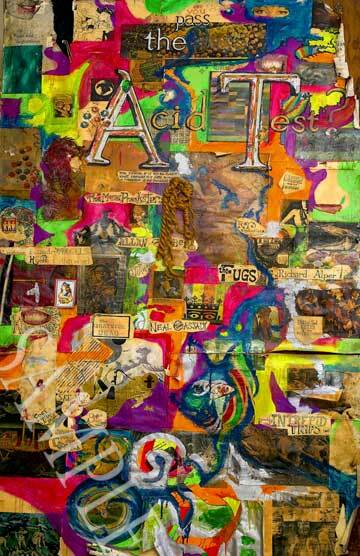 Big, Beautiful and Busting out of your wall with color and crispness. 18 X 27 on nice thick paper. 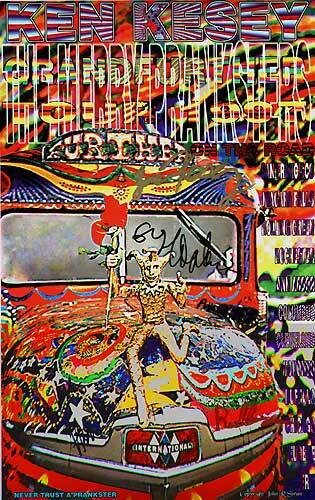 Or get the multi-Merry Prankster signed version. Official poster from the "GrandFurther Tour" in 1995. 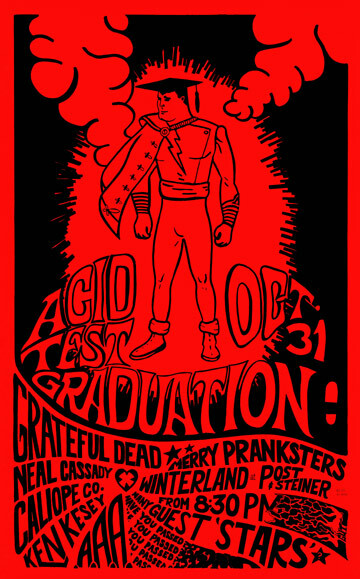 Ken and the Merry Pranksters (and Grandchildren) drove Furthur to be in the Rock and Roll Hall of Fame. The tour included the cities listed: San Francisco, Niagra Falls, Rolling Green, Rochester, Ann Arbor, Columbus, Cleveland, Toronto, Buffalo, Chicago, Eugene, and Erie. Signed by the Merry Pranksters !